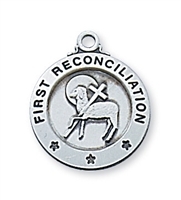 First Reconciliation is a special occasion because it marks the first time a person is forgiven of their sins by God. Hopefully this starts a pattern of living in which they consistently avail themselves of this sacrament and stay close to God. With these medals, the person will hopefully remember throughout their life of this great opportunity and make full use of it. Gold Filled First Reconciliation Pendant, Gold Filled Lite Curb Chain, 1/2" x 1/4"
14 KT Gold First Reconciliation Medal, 1/2" x 1/4"
Sterling Silver First Reconciliation Pendant, Sterling Silver Lite Curb Chain, 1/2" x 1/4"